One thing that Cass and I love almost as much as golfing together is watching the pros golf better than we ever could! 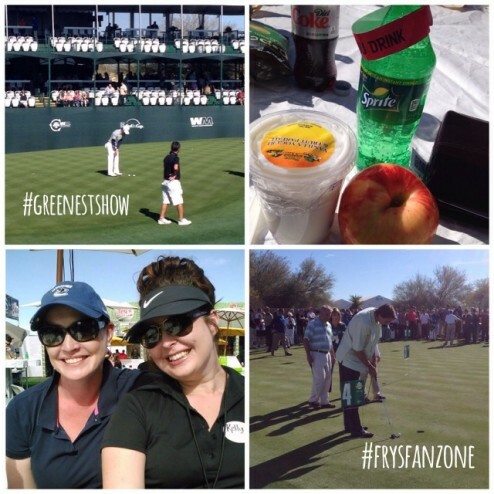 Today we spent a fun day at the Waste Management Phoenix Open, enjoying the sunshine and lively atmosphere of “The Greatest Show on Grass” as guests of Fry’s Marketplace. The tournament has yet to begin, though, so there’s plenty of time to get out there and enjoy the biggest party on the PGA tour. We even found a nifty way to score a free ticket–when you purchase $25 of qualifying products at Fry’s (including Coke products, Leinenkugel beers, and Pop Chips), you’ll notice a voucher printed at the bottom of your receipt. Just bring that to the ticket counters at the main entrance and you’re in! A General Admission ticket costs $30, so this is a really good deal! And be sure to visit the Fry’s exhibit in the expo tent (you’ll funnel through the expo tent as soon as you pass the main entrance) for a chance to win a free beverage voucher in their Hole In One contest and pick up some other freebies. One of the experiences we look forward to most at the Waste Management Phoenix Open each year is the chance to get up close to the pros. Today was just practice rounds, but we got to see plenty of pros in the celebrity putting contest to benefit the Special Olympics! Randy Johnson, Mark Grace, JJ Putz, Bruce Arians, Padraig Harrington and Rickey Barnes were all there to show their support. We enjoyed the gorgeous 75 degree weather with a picnic lunch in the Fry’s Fan Zone. In addition to delicious offerings by Garcia’s and Zinburger, we were thrilled to find some healthier meal options like a turkey wrap, caesar salad, and yogurt. We resisted the fried foods and splurged on some blood mary’s to celebrate! We had so much fun this time that we’re going back tomorrow! Does anyone else look forward to the Waste Management Phoenix Open like we do? 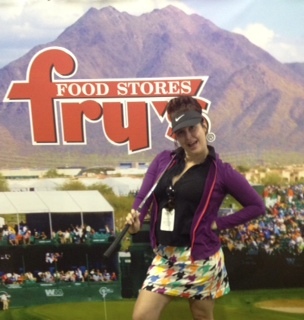 Leave a comment below with what you love or hate about the WMPO for a chance to win a $25 Fry’s gift card! Winner chosen by Random.org on Friday! Disclosure: Fry’s selected a group of Bloggers, including me, to create posts about their Waste Management Phoenix Open ticket offer and their presence at the Waste Management Phoenix Open. They provided me with access to the event all week long and a Fry’s $25 gift card to thank me for my participation and post. I’m thrilled…. because I LOVE this time of year! Weeeeee! 2014 is shaping up to be a great year: the kids are having stellar academic success, we’ve avoided the flu and RSV (a constant concern at our house due to the twins’ weakened respiratory systems), pitchers and catchers report in just nine days and the pieces around our charity golf event are all falling into place. But for my parents, January 2014 has something in common with January 2007: they are unexpectedly expecting twin grandbabies. Again. Out of scores of aunts, uncles and cousins on both sides of the family, the only people to become pregnant with multiples are my sister and me. I don’t know if my parents wonder what they did wrong with us or what they did right. Two daughters, two sets of twins? Like my sister and I didn’t overachieve the hell out of the 1990’s enough?? I’m still waiting for the delayed reaction of the cardiac variety on the part of either of my parents, but suffice to say they’re keeping that Gerber Baby life insurance company in high heels these days. Until 2007 the last set of twins born on any side of any of our families occurred in 1932. I’ll never forget surprising my folks with my ultrasound picture showing Kyle & Lauren cozily gestating together. Imagine everyone’s surprise not too long ago when my sister announced she was pregnant with twins! Actually, all I can recall from that moment was my husband and I literally pointing and laughing at her. I know–we express our love and support to each other in unique but profound ways. Twins! Sure, it’s a blessing and all that, right? Everyone wants to have twins, right?? Double the trouble and double the fun, right?? Yes, and no. Truthfully I don’t personally know of anyone who felt this way when they found out they were pregnant with twins. Not that those perky, positive pregnant women don’t exist, but if I may be frank–don’t call me Frank–the only women I know who say that are women who don’t have twins. Because the truth is that the reality that comes with an ultrasound with more than one handsome little devil in the frame can be overwhelming. Not just one nursery needed now, but two–I hope your house is big enough. Sometimes the backseat of your car isn’t even long enough to accommodate twin car seats if you also have an older child in a booster, so have fun measuring your car’s dimensions and then maybe trying to afford a new car. One baby is a lot of work, and twice the number of babies are sometimes more than twice the amount of work–and let’s hope you can afford double the daycare expenses. And for some of us, a pregnancy with multiples becomes a high risk pregnancy, and suddenly getting your pink and blue nursery or buying those Thing 1 and Thing 2 onsies seem like really shallow reasons to have ever wanted twins. And double the fun? How about double the co-pays, every doctors’ visit, every time–beginning the instant when Baby B is born. Okay, so maybe I’ve scared your collective ovaries into never ovulating twice in the same cycle. It’s not that twins aren’t great–but they’re great because they’re YOURS, not because their formative weeks were spent with a womb mate. If your twin pregnancy, birth, and first few months at home don’t give you a heart attack, watching your two wee ones becoming aware of their world, learning to smile, growing up with each other as best friends and co-conspirators are really the best things about having twins. You just have to get through the hard part at the beginning. It really does get better. I promise. And whatever you do, pack a hospital bag every time you have an ultrasound–I learned that lesson the hard way. Figure out when the least convenient time would be for you to be hospitalized for a few days and that’s exactly when your cervix will prematurely dilate. It’s science. I hope you’ve enjoyed following along with my journey as I’ve met with my Registered Dietician, Michelle Dudash, and learned about the value of Milk as an added source of protein. Michelle was paired up with me for this amazing sponsored campaign. I can’t believe this is post 3 in our 4 part series! Last week, I shared with you my exercise routine. I’ve lost 20 pounds in 10 weeks by changing my diet and regularly exercising. My results may not be typical. But I’m proud! You can do it too! I’d love to hear about your progress! This week, I’m sharing with you a week’s worth of protein packed breakfast recipes to get you and your family up and running or the day! Enjoy! Would you share one of your favorite breakfast recipes with me in comments below? I’m always looking for something good! 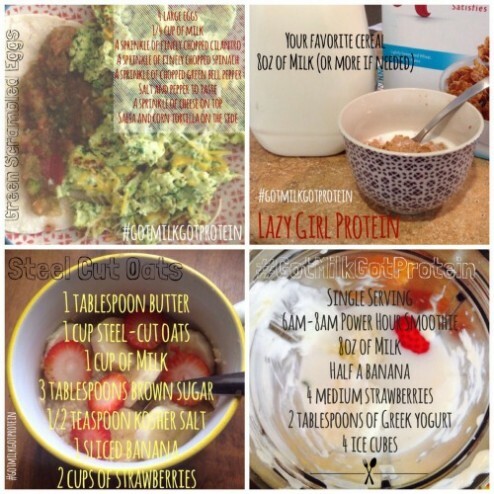 Friday: Smoothie of choice – Check out all the delicious recipes on Michelle’s blog! For additional Milk resources… follow #GotMilkGotProtein all major social media channels. Do I have to eat like a caveman? Are there foods that will decrease that bloated feeling? I’m sure that many of you have asked yourself some of these questions before. I’m please to announce that I’ve partnered with MILK in a campaign to help spread the news about healthy eating (especially in the morning). Did you know that between 6am and 8am are your “power hours”? Starting your morning with high-quality protein will help you to stay fuller longer and help you (and me) to stick to those healthy eating resolutions! 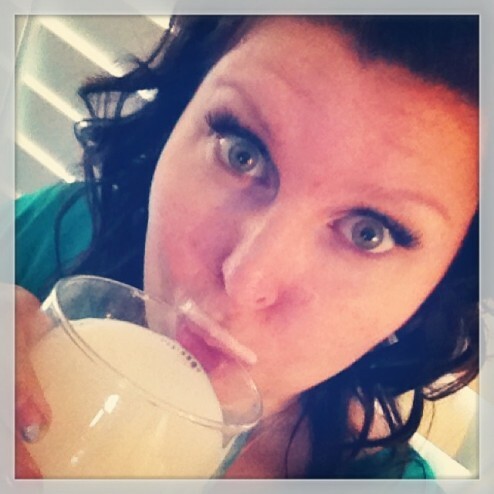 As part of my partnership with MILK… I’ve been paired up with a Registered Dietician. Her name is Michelle Dudash and she’s pretty darn amazing. Michelle and I will be meeting up to discuss my goals, answer my questions, and even create some recipes that work for me and my family. 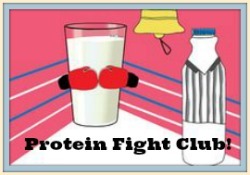 At our most recent meeting… we talked about protein. I struggle to remember what foods have protein in them beside meat. I really don’t want to eat meat all the time just to get in my protein! Michelle helped me find other ways to get in my protein: nuts and seeds, eggs, yogurt, beans, cheese, and Milk! 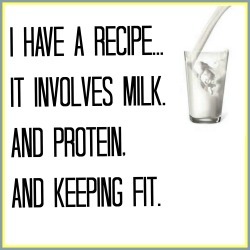 There’s 8g of protein in an 8oz glass of milk! Combine all ingredients in a blender, and working up to a high speed, puree until smooth. Michelle and I did a news segment recently. Don’t judge my on camera skills! But you can check it out below. We share some healthy and protein packed breakfast ideas for you and your family. I hope you’ll keep coming back. I’ll have something new each week to share!